Friday was my daughter's 1st birthday. I can't believe how fast she has grown! 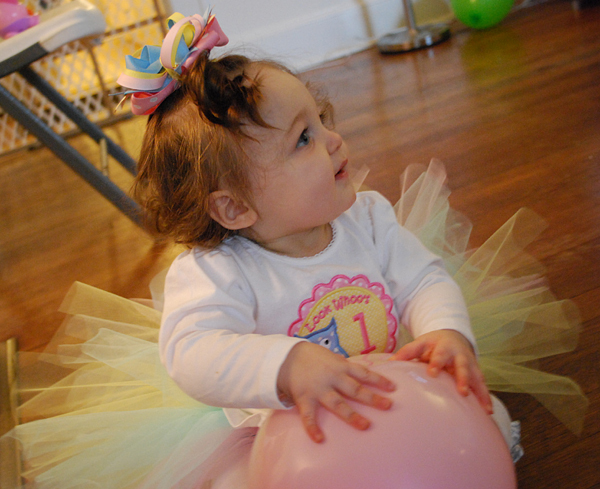 It feels like just yesterday we were in the hospital waiting for her to come into this world.We had the grand celebration of her birthday on Saturday, complete with plenty of friends and family. It was so much fun! The theme of her birthday party was Owls. We chose the theme because we've always thought she looked like a little baby owl because of her big wide curious eyes. This was pretty much the basic set up of the main table. 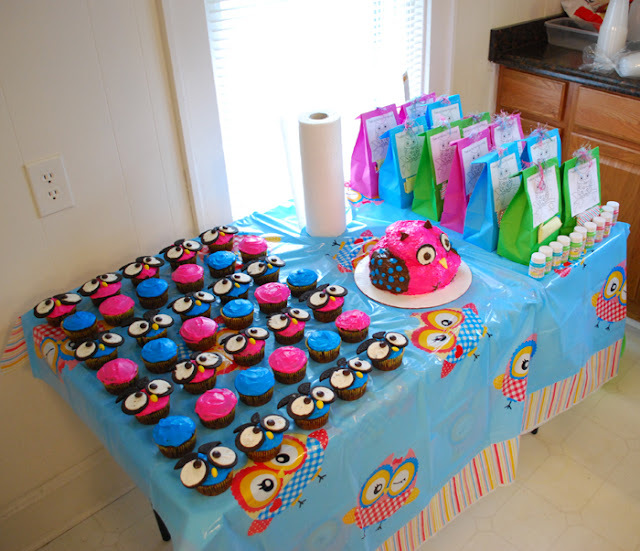 There were matching streamers, balloons, and a Happy Birthday banner strewn across from the kitchen and dining room to the living room. A friend of mine made Charlotte's smash cake which is the big owl in the middle. I made the owl cupcakes. I also made the little favor bags. Inside of them is candy, an owl finger puppet, and bubbles. On the outside of the bags - I added an owl coloring sheet along with a set of four assorted crayons. The best part definitely had to be singing happy birthday to Charlotte and letting her smash the cake. She was covered in icing! She really dug into that cake. In fact - she even grabbed the icing before we could blow the candle out. 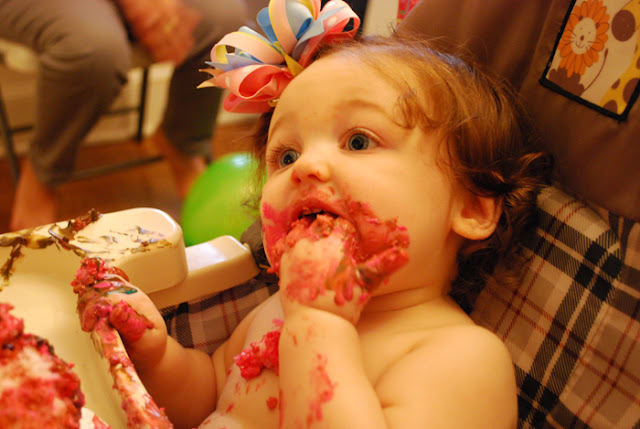 I think the smash cake was her favorite par too. She loved opening the gifts. She got some really cute things like a cabbage patch doll that was named Charlotte and born in October (just like her! ), a few owl stuffed animals, an elephant that uses air to blow little balls out of his nose, and so much more. The gift we got her is in the picture above. It's a little alphabet train. It comes with a ton of alphabet blocks and she loves it! It teaches colors, 1 2 3's, and A B C's. The little caboose in back is made to be sat on so she has the option to ride it. 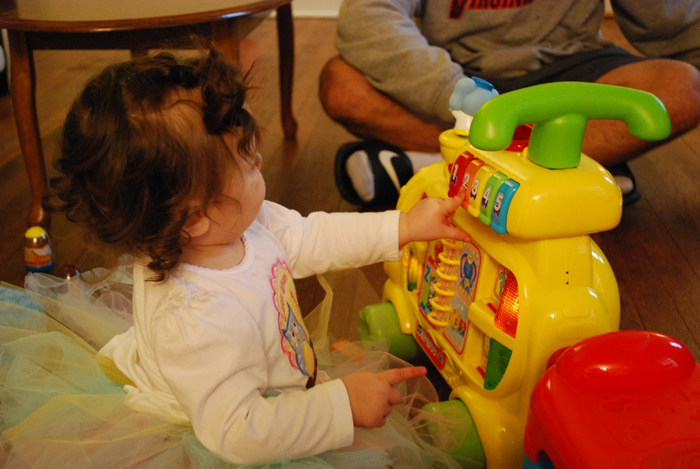 The caboose can come off and she can hold onto the bar and push it (it can help her learn how to walk). It seems to be her favorite toy out of the batch. The party was a great success and we really enjoyed ourselves. I think Charlotte enjoyed it too and we got a ton of pictures to capture the memories. As much fun as it was though - I'd be lying if I didn't tell you that I am glad it's all over with. I never realized how stressful planning a party could be! It was well worth it though to see my little owl have a huge smile on her face. And now of course it's Halloween. Happy Halloween to everyone! We're going to do a little trick or treating and then come back home to pass out candy. I'll be sure to share the costume cuteness with everyone! I hope you all have a safe and fun Halloween.